The instructions are supplied as a 4-page A5 colour booklet, with each scheme illustrated as a clear 4-view diagram. The colours for each option are given with FS, Humbrol, Xtracolour, Xtracrylic and Lifecolor matches. The North American Aviation P-51 Mustang is an American long-range, single-seat fighter and fighter-bomber used during World War II and the Korean War, among other conflicts. 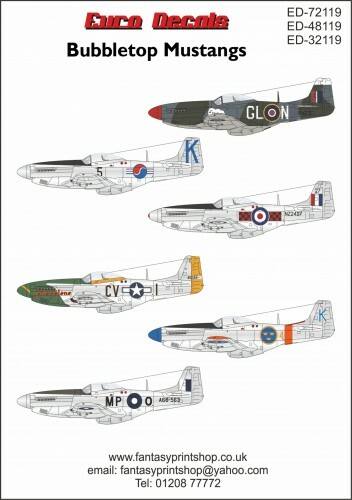 The Mustang was designed in 1940 by North American Aviation in response to a requirement of the British Purchasing Commission. The Purchasing Commission approached North American Aviation to build Curtiss P-40 fighters under license for the Royal Air Force. Rather than build an old design from another company, North American Aviation proposed the design and production of a more modern fighter. The prototype NA-73X airframe was rolled out on 9 September 1940, 102 days after the contract was signed, and first flew on 26 October.